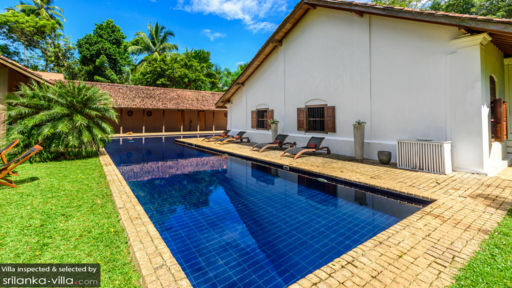 Saying that Villa Maya is a dream home for tropical travellers is an understatement - the home checks off all the right boxes, and more with its extensive garden, views out to lush rice paddies, indoor-outdoor living spaces, impeccable service and sparkling pool. With five bedrooms spread out across the property, Villa Maya is ideally kitted for groups of 10. It’s also equipped for hosting destination weddings and events, as well as yoga and romantic retreats. Villa Maya sleeps 10 guests in five bedrooms. All bedroom feature lofty ceilings, sweeping vistas out to the pool and rice paddies and vintage furnishings. Hairdryers, bathrobes and bathroom amenities are provided. Both the Thekka and Khumbuk rooms feature similar designs, and are located across each other. You’ll find amenities like a beautifully made four poster bed, antique furnishings and private en suite with rain shower. The Amba and Ehela rooms feature a modern decor style, with light colours and clean lines. The attached en suite is generously proportioned, and sliding doors from the room and bathroom open out to reveal a spacious private courtyard. The fifth bedroom, Kohomba offers ultimate privacy; the room extends out to include a covered courtyard and private garden. The glimmering L-shaped pool at Villa Maya overlooks emerald paddy fields. Loungers are scattered all around the pool, and pool floats are provided at request. Beyond the pool, Villa Maya features a breezy terrace - the perfect spot for reading, shaded siestas or enjoying afternoon tea sessions. The sprawling garden, peppered with palms and tropical foliage are ideal for outdoor yoga, playing with the kids or a relaxing stroll. Additional amenities like pool floats, board games, garden games, petanque, volleyball and badminton equipment will keep your entire travelling party well occupied! Enjoy the best of indoor-outdoor living at Villa Maya when you unwind at its spacious open-air pavilions. The main living area comes equipped with sofas, a coffee table, lounge chairs and dining set, and offers unobstructed views out to the garden. Browse through the library, and you’ll stumble upon a large collection of books, CDs and DVDs. You’ll never be left wanting for more at Villa Maya, thanks to the impeccable service delivered by a team of 14. Housekeeping, child-minding service and transport for excursions and airport pickups are provided. In-villa dining promises to be an exception experience at Villa Maya. While a full menu for lunch and dinner is available, the staff are more than happy to adapt the menu to your preferences. Choose from a selection of enviable dining locations, which ranges from the atmospheric dining room, to the poolside, outdoor pavilion or well-manicured garden. Cooking lessons with the chef are available at request. Villa Maya offers packages for honeymooners, as well as cultural, wildlife and yoga travellers. 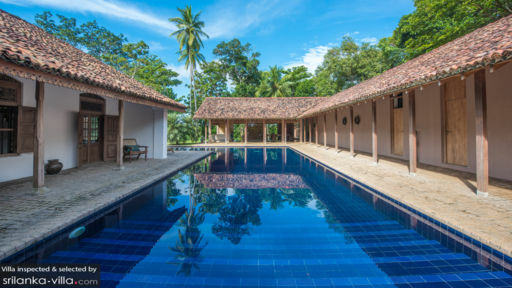 The wildlife and cultural packages include meals, transportations and excursions, while the yoga package features vegetarian meals, yoga mats and lessons conducted by Mahesh Kodikara, an internationally trained Iyengar Yoga and Tai-chi teacher. The property is also ideal as a venue for honeymoons, destination weddings and anniversaries. The on-site team are happy to handle the details of your celebration, which range from crafting signature cocktails, to organising personalised ceremonies and assisting with event planning. 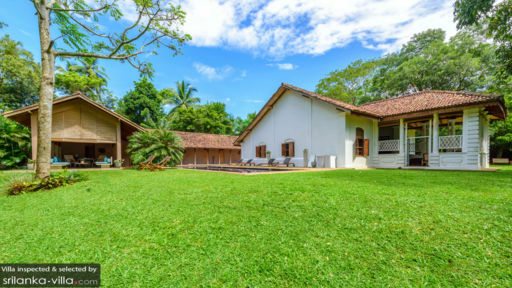 Villa Maya is located in Tangalle in the southern region of Sri Lanka. The town draws villa vacationers with its palm-fringed beaches, glimmering sea waters, water sports (it’s a great destination for surfing and snorkeling) and cultural attractions. From your villa, you’re 10 to 15 minutes’ drive from the beaches of Tangalle and Goyambokka. Come here to soak up the tranquil ambience, breathtaking sunsets and sunbathe upon the powdery shores. Bandula Surfing School is located at Tangalle Beach, so villa vacationers may try out a surf lesson or two while they’re hanging out by the coast. Or kayak across the shimmering waters and mangrove swamps of Tangalle Lagoon (you can do this on your own, or with a guide). The lagoon is located about eight minutes’ drive away. Located in the region are iconic attractions like the Wewurukannala Vihara, Madunagala Hermitage, Mulkirigala Rock Monastery, The Turtle Conservation Project at Rekawa Beach and Bundala National Park. Feel free to reach out to your villa manager for further information, or if you need assistance with transport and tour bookings.